The World Cup stadium in Saransk was packed with 26,564 seeing Mordovia Saransk play their first game of the season against Olimpiyets Nizhny Novgorod. Newly promoted the former Russian Football Premier League club competes in the second division Football National League this season. 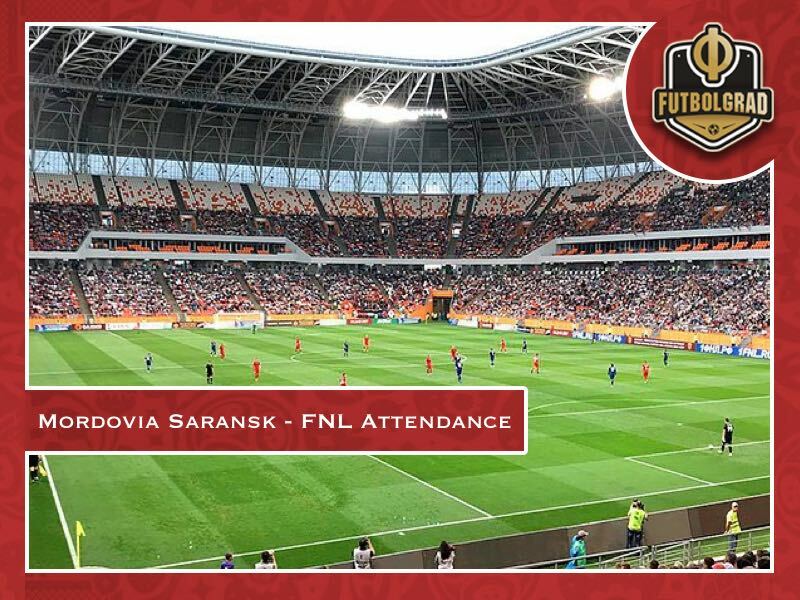 With a turnout of 26,564 Mordovia easily topped attendance numbers on matchday 1 of the FNL. The average attendance on the first matchday of Russia’s second division was 3000-4000 with Zenit’s academy club Zenit-2 drawing a mere 400 for their first match of the season against Tambov. Hence, the big turnout is a fantastic story for Mordovia Saransk. Saransk was the smallest of Russia’s World Cup cities and often drew criticism by members of the press for its provincial flair and lack of infrastructure when it came to hosting World Cup games. Furthermore, with a capacity for 44,442 spectators, the Mordovia-Arena was often considered too significant for the local club Mordovia Saransk. After all, Mordovia had just spent a season in the Professional Football League – third division. It was the nadir of a club that only two years ago had spent two seasons in the Russian Football Premier League. Hence, Saransk was often viewed among the Russian World Cup stadiums that would be in danger of becoming a white elephant at the end of the tournament. Those fears are now somewhat undermined with the fantastic turnout on matchday 1. Who after all would be able to fill the 44,442 seat stadium on a regular basis? The numbers from matchday 1, of course, have now given a sense of optimism. The question, however, is how much of the turnout is due to the post-World Cup enthusiasm? Did fans turn out to see Mordovia play or was the big turnout a result of fans wanting to see the new stadium for the first time without having to pay World Cup ticket prices? To answer that question it helps to go back in time to the 2006 FIFA World Cup in Germany. In Munich Bayern and 1860 München shared the Allianz Arena. The stadium was one of the venues for the 2006 FIFA World Cup and in the season leading up to the World Cup and the year following the World Cup 1860, in particular, enjoyed high turnouts besides playing in Bundesliga 2 – Germany’s second division. Mordovia Saransk – The next 1860? During the 2005/06 season, 1860 München averaged 41.673 spectators per game playing in Bundesliga 2. It was the highest average in the second division and the club’s highest all-time average attendance. But with Bayern having every single one of its home games sold out and World Cup tickets being hard to come by many fans attended 1860 games to see the stadium, not the club. By 2006/07 the attendance dropped to 36,229 and as the club continued to struggle with life in the second division attendance soon started to fall as the excitement of playing in a World Cup stadium seemed to wear off. In the end, the club had to move out of the facility. 1860 München’s story highlights that Russia’s World Cup stadiums might see a short-term influx of curious World Cup stadium tourists, but to make the stadia viable clubs need success. In the case of Mordovia that would mean quick promotion back to the first division – a story that is also true for the World Cup stadiums in Nizhny Novgorod, Volgograd, Sochi and Kaliningrad. 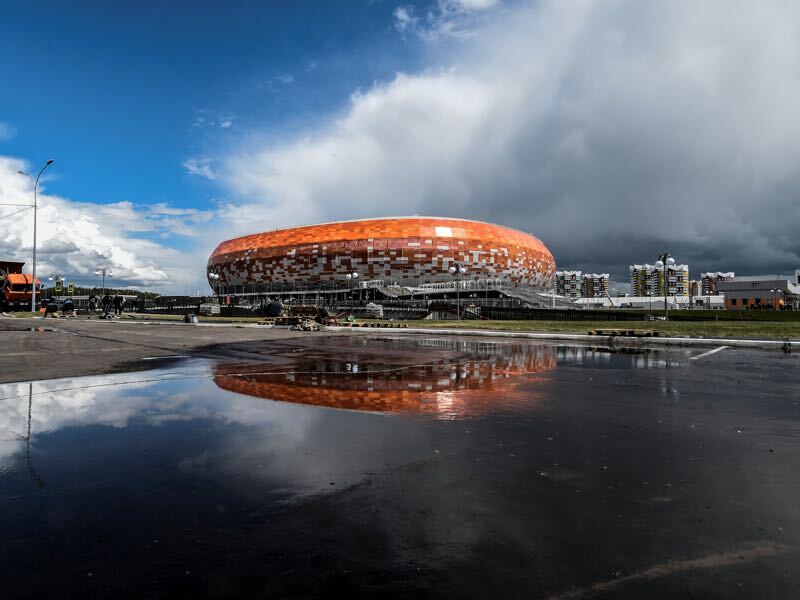 After all, the excitement can only be kept up with success otherwise the World Cup stadiums in Saransk, and elsewhere, will become in danger of becoming white elephants. Hi, is it possible for the site to do a general season preview/prediction for the FNL? I visited Russia for the first time last weekend having met someone from Kaliningrad earlier in the year, and watched Baltika v Tambov in the stadium with my new pals so I am interested in it, and loved Russia overall. a full preview might be tough due to lack of manpower. But we will cover the FNL extensively both with written content and also on our Futbolgrad Podcast.